GKIDS, the acclaimed producer and distributor of animation for adult and family audiences, has announced the English voice cast for MFKZ. 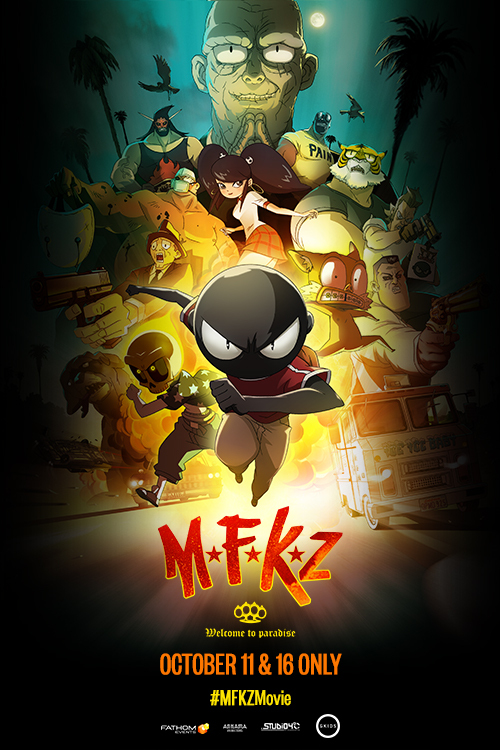 MFKZ is a collaboration from French comic artist Guillaume “Run” Renard, original creator of the comic series, and ultra-hip Japanese animation house Studio 4°C, creators of the acclaimed anime features “Tekkonkinkreet,” “Genius Party,” and “Mind Game.” The film will feature the voices of Michael Chiklis (The Shield, American Horror Story), Giancarlo Espositio (Breaking Bad, The Usual Suspects), Jorge Gutierrez (The Book of Life, Son of Jaguar), Dascha Polanco (Orange is the New Black, Joy), RZA, Vince Staples, and Danny Trejo (Machete, Predators). The “Tekkonkinkreet” dream team of co-director Shojiro Nishimi and art director Shinji Kimura reunite to bring to life MFKZ, a dark but stunningly animated sci-fi vision mélange of anime, film noir, and Lucha Libre, which made its world premiere at the 2017 Annecy International Film Festival. The Fathom event will include an exclusive behind-the-scenes look and interview with the film’s creators.